Named after John P. McEnery (father of former Mayor Tom), who was prominent in local politics and community life in San Jose, the park is located on the south side San Fernando Street, just east of the river. McEnery Park was carefully designed for children’s creative play. For older kids, there’s a structure of nets and ropes to climb on. For little ones, there are colorful spring toys and a model boat. But most children (and their parents!) will be playing in the river. (Unfortunately, the water feature is not operational at this time.) That’s not the Guadalupe River itself, but a re-creation of the Guadalupe. This new “river” forms the central spine of the park. It starts in the mountains with mist and boulders, flows through sandy foothills, and meanders on a broad plain before disappearing into irrigated fields. You don’t need to know all this, however, if you are four years old and just want to run through the misty sprays of water on a hot day or make castles in the sand! 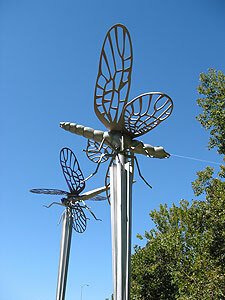 Playful dragonfly sculptures hover above the river, calling out the need for all rivers to be free of pollution. Long arcing benches follow the sinuous flow of the water. Diagonal paths have patterns inviting children to count and read and measure. Completing the park are picnic tables, restrooms, and lawn areas for relaxation and play. McEnery Park is a valuable addition to the downtown, in itself, but may be better seen as one of a chain of opportunities for families who wish to spend time enjoying the river park. Spend a morning at the Children’s Discovery Museum, check out the structure of the Children’s Bridge, spend a few quiet moments at the Okayama Sister City commemoration, enjoy a picnic at McEnery Park, and then take a ride on the Children’s Carousel at Arena Green. The best family outings often include outdoor experiences where kids have the freedom to run, climb, and play creatively. McEnery Park offers all of that, in a setting close to home. We invite you to come enjoy this unique children’s attraction!